Today we’re launching the itch.io global community! A community has always been a big part of growing itch.io. 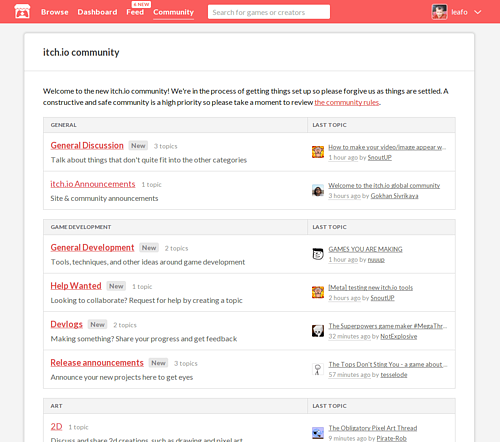 Over the past few months we’ve added features like comments on project page, and message boards on game jams. In order to get the community started we’ve put together a couple boards with topics we think people might be interested in. They are definitely not final! If you’ve got any feedback we’d love to hear it. Since the majority of our audience is game developers we’ve started off with some game developer specific sections. We encourage self promotion, but we ask not just to dump links. Use it as a way to expand your audience by building a relationship with those who check out the itch.io community. Starting a brand new forum and asking people to join can be tricky, so we’ve also got a brainstorming topic. We’d like to integrate the community into itch.io so if there are any events or topics you think are missing don’t hesitate to speak up.